One of my grandfather's cousins played a few songs on his musical saw at our family reunion this past weekend. Here's a video of him playing "My Country, 'Tis of Thee." That is so cool. My kids would be very intrigued by that- we've never heard a musical saw before. Oh my goodness that is so neat!! He sure is one creatively talented Grandpa!! Can he play anything on it? That is cool! 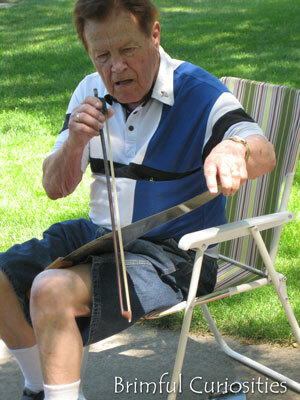 Please tell your grandfather's cousin that he is invited to play his saw at the annual NYC Musical Saw Festival. The next festival is July 16th, 2011. If that is too soon for him, he can plan for 2012. Please tell him to see info at www.MusicalSawFestival.org and to contact the festival through that website for an official invitation. Very cool. My daughter would love that! Not many can do that. Too cool. Wow! this is just amazing.I haven't seen anything else like this before! Great piece of information here. Thanks for this brilliant stuff.